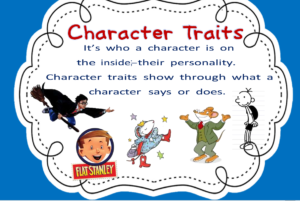 Here are some useful activities for working on character traits with your reading student. Helping our students think beyond the text is sometimes challenging. While our adult students can easily complete questions in which the answers are stated directly in the story, they often struggle with questions that require them to apply their background knowledge and thinking skills. Examining an author’s word choices to describe a character’s traits and emotions, and thinking about his actions and words can help students develop a deeper understanding about what the author is trying to convey about that person. First, it is important for students to understand the difference between emotions, which are fleeting, and character traits, which are part of someone’s personality. A person can feel different emotions – happy, sad, surprised, on any given day, but someone who is optimistic – a character trait – has a generally positive outlook on life despite daily trials and tribulations. Ask your student to name a few emotions. Write each one on an index card or piece of paper. Make sure you have a list and help out if your student can only come up with two or three. Some emotions include joy, fear, anger, sadness, disgust, surprise, shame, pity and envy. Talk about how authors often use many different words to describe emotions. There are many synonyms for joy. Ask your student to come up with some. This activity will help expand your student’s vocabulary. 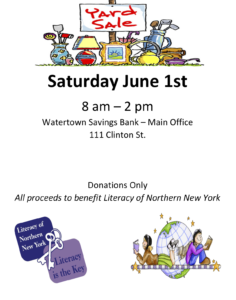 Vocabulary development is an important component of reading comprehension. Some synonyms for joy are: happy, glad, delighted, pleased, thrilled, ecstasy, elated, exulted, rapture, bliss, etc. You can also talk about degrees of joy such as pleased versus bliss or glad versus exultant. Authors choose words for a reason. If the author writes that someone is elated, it is a much stronger emotion than pleased. What is the author trying to convey about the character? Choose two or three emotion words and repeat the activity of finding synonyms and discussing degrees of emotion. One way to find synonyms for emotion words is to use Microsoft Word’s thesaurus. (Click on the review tab and then click on thesaurus). Type in a simple emotion such as sad and you get a long list of words including miserable, depressed, gloomy, down, blue, wretched, dejected, despondent, melancholy, woeful, etc. Or if your student quickly runs out of ideas for synonyms, ask him to use his phone (or use yours if the student has limited minutes) and go to www.thesaurus.com. This site lists many synonyms for anger including: fury, ire, animosity, annoyance, indignation, peevishness, mad, antagonism, rage, etc. If your student is a lower-level reader, have him pick some of the shorter words he is familiar with but also include several longer ones. 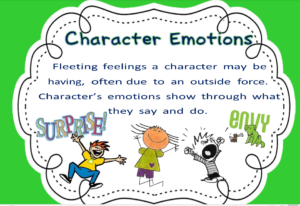 Once your student understands the difference between emotions and character traits, there are some wonderful graphic organizers that help students study characters. We have also posted some of them to our website. The character traits reading response organizer asks students to examine a character’s feelings, dialogue, and actions to determine some of that person’s character traits. The Analyzing Characters graphic organizer asks students to examine the character’s words, appearance, thoughts, actions, and what others say about him, give an example and then figure out what this information reveals about the person. This activity really makes a student think about the story and to think beyond the text. It is best to model the activity first, using a short story or passage. You can highlight or underline words indicating emotion and character traits. Then model how you would use the highlighted information to fill in the graphic organizer. Thinking aloud as you fill in the graphic organizer helps teach the student how to do it when it is their turn. Now it’s the student’s turn. Guide the student through another short story or passage, and ask them to underline key information about a character’s emotions and traits. Which of their actions or words give a good insight into their character? Repeat the process until the student is able to fill out the graphic organizer without any assistance. Authors rarely state outright that a character is stubborn, nurturing, or some other personality trait. Good readers have to scrutinize what the character says, feels, and does in order to determine what kind of person they are. Just like in real life, some characters talk one way but their actions belie their words. Or the character doesn’t say much but his actions speak volumes about him. Good readers who want a deeper understanding of the text study these character clues and draw their own conclusions. Consonant Sounds Pictures of key words for consonant sounds. Syllable Types Learning the six syllable types helps students with vowel sounds.